Medusa refuses to care for her hair, her long locks getting knottier and dirtier with each passing page. Her hair rebellion elicits frozen expressions of shock from her family, but nothing will convince Medusa to brush. Only her hairdresser approaches Medusa with bravery and a blade, successfully solving the problem...with a short haircut! All are pleased with this drastic yet adorable solution. Leslie Patricelli's depictions of this physical comedy bring a lively visual narrative to Joan Holub's expertly focused text. 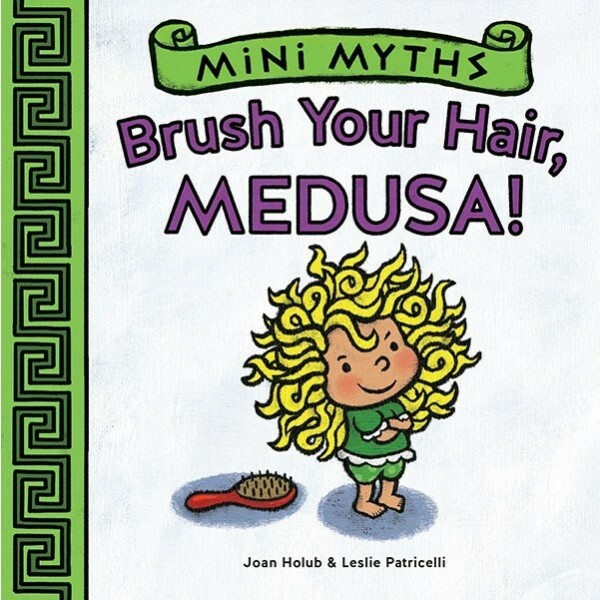 The board book also includes a summary of the original Medusa myth at the end.